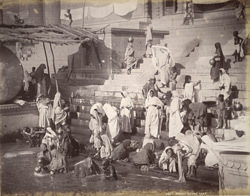 Photograph of women and children washing and collecting water at a ghat in Varanasi (Benares) in Uttar Pradesh, India, from the Macnabb Collection: Album of views of India and Burma, taken by Bourne & Shepherd, most likely in the 1880s. Varanasi is one of the seven sacred cities of Hinduism, situated on the Ganges River at a place where it bends to the north, considered to be an auspicious direction. Much of the religious life of the city revolves around the ghats. Hindus believe that bathing here purifies them of sin. It is known as a tirtha or ‘crossing place’ where devotees can gain access to the divine and where gods and goddesses can come down to earth. It has been a centre of pilgrimage among Buddhists, Hindus and Jains for more than 2500 years. The city’s riverbank is dominated by a great number of ghats, long flights of stone steps, where people come to perform religious rituals including cremation and ablution in the River Ganges. Pilgrimages involve immersion in the river at particular ghats and bathing in sacred kunds (tanks) as well as visiting auspicious sites and temples to worship.